(Chris Detrick | The Salt Lake Tribune) Brigham Young Cougars Zayne Anderson (23) tackles Portland State Vikings wide receiver Kahlil Dawson (5) during the game at LaVell Edwards Stadium Saturday, August 26, 2017. Provo • Can a defense get speedier but still remain stout against the run when it faces the likes of Arizona, Washington, Wisconsin and Utah? BYU football coach Kalani Sitake is determined to find out. A theme of preseason camp for the Cougars this month has been the need for speed on defense. To accomplish that, Sitake has made plenty of position changes, drawing upon what he used to do as Utah’s defensive coordinator. It is all part of Sitake’s oft-stated goal to get the best 11 defensive players on the field at the same time. Offensive coordinator Jeff Grimes said BYU’s running backs — perceived to be nowhere near the caliber of backs the aforementioned Power 5 schools possess — averaged 4.8 yards per carry in the scrimmage and the offense was 62 percent efficient on running plays, meaning it got what it wanted 62 percent of the time. 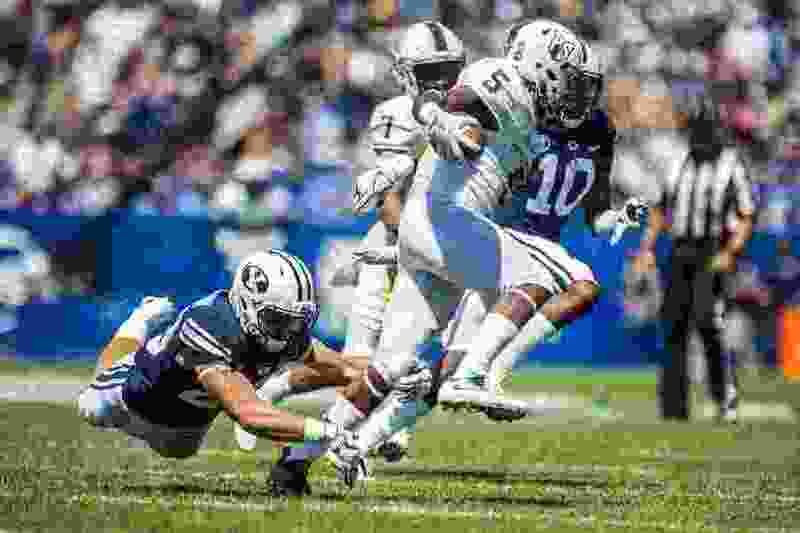 Sitake, who is more involved with the defense now than he was in his first two seasons at the helm, declined to compare the speed of this defense with past defenses at BYU, but on paper it might be the speediest of them all. The most notable changes began in spring camp and have carried into August. Two-year cornerbacks Dayan Ghanwoloku and Troy Warner are now safeties, Ghanwoloku (formerly Dayan Lake) at strong and Warner at free, where he is described by new safeties coach Preston Hadley as a co-starter with Utah transfer Austin Lee. Whether Warner and Ghanwoloku remain at safety or go back to cornerback depends on the development of the young corners — Chris Wilcox, Keenan Ellis, Trevion Greene — and senior utility man Michael Shelton. Hadley, the former Cougar defensive back who came over from Weber State’s staff, said if Ghanwoloku and/or Warner is moved to corner, guys such as Lee, Sawyer Powell, Isaiah Armstrong and former running back Austin Kafentzis are equipped at safety. Big-hitting senior Zayne Anderson, a safety last year, has been moved to the flash linebacker spot that Fred Warner successfully played the last three season. A track star in the 100 and 200 meters at Stansbury Park High, Anderson’s strength is his speed. He is excellent in pass coverage, a benefit because the flash LB is sort of like a third safety on the field. The question is whether Anderson is stout and physical enough to consistently stop the run at 215 pounds. In another change, senior Sione Takitaki is now the starting weak side linebacker, after playing defensive end last year. He was an excellent speed rusher last year, but defensive coordinator Ilaisa Tuiaki feels good about ends such as Corbin Kaufusi, Trajan Pili and Uriah Leiataua to improve BYU’s pass rush.